Car all scratched up? It happens to us all every now and again, no matter how much we baby our rides. The best car scratch remover can do a whole lot more than an average one to restore your car to its former glory. Finding the best car scratch remover on the market isn’t easy, though—not with so many options out there. Taking into consideration your personal needs and your budget can just make the whole process more confusing. 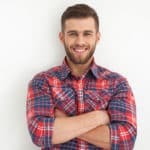 This article is here to help – between a buying guide that covers all the basics and five in depth reviews of some of the best car scratch removers around, I’ve got you covered. I tested over 20 of the most popular and best reviewed car scratch remover products on the market, and these five were the top performers across the board. While I’ll go into a lot more detail later on in the article, this comparison table is here to summarize the specs and features of each scratch remover to make your final decision as easy as possible. With plenty of popularity and buzz, along with some unique features, this may just be as exciting as car scratch remover systems get. But does it live up to its name, and is it worth the price? Read on to find out! As both an internet and as seen on TV sensation, plenty of people have experienced this product. After hearing all the buzz, as well as mentions of a few flaws in the system, I had to try this product out for myself. The first thing I noticed was overwhelmingly positive: the quality of the accessories. While many car scratch remover “systems” contain great formula, they provide only flimsy strips of sandpaper. This product’s accessories, on the other hand, are built to last. If your car gets scratched frequently, the longevity of the accessories you’ll need to apply the formula might make this a better investment than more disposable products. This might also make it a great choice for those of you who remove even the tiniest scratches as often as you can. It’s not just the accessories that make this product shine. The scratch removal formula itself is fantastic. It works faster on light scratches than many similar products, and is great at moderate to deep top coat scratches that some other removers won’t touch. One of the most surprising special features of this product was the instructions. You might think it sounds silly to praise a product’s owner’s manual, but in the case of the Ultimate Car Scratch Remover System, the directions go a long way toward making things easier for new users. The whole simple, step by step process is one of the things that really sets this product apart from its competitors, and the instructions go a long way toward making scratch removal possible for anyone. However, I haven’t seen a product yet that’s completely perfect. There are a few flaws even with the Ultimate System. The first one that will jump out at many consumers is likely the higher price tag. That being said, this potential flaw isn’t as big a deal to me. Because of the high quality construction and overall longevity of the accessories, this kit still packs plenty of value. One more significant flaw for me is the relatively small amount of formula that comes with the set. While it’s perfectly good for removing quite a few light scratches or even several fairly deep ones, it won’t last for months or years. On the other hand, replacement formula is cheap and widely available. In addition, there are a variety of other optional features you can add onto this kit, such as bottles of primer and clear coat that can be used to repair very serious scratches. All in all, this kit has quite a bit going for it, and only a few noticeable flaws. Let’s take an in depth look at the pros and cons. This is a great product, but the price may be too steep for some users. I’d recommend it for those of you who are extremely detail oriented when it comes to your car’s top coat, as well as anyone who scratches up their ride frequently. It makes a much better long term investment than disposable kits and even most other kits with a similar design. What makes it a great value for repeat users is the high quality of accessories. While your initial purchase will be much more expensive than cheap disposable kits, it may end up being cheaper in the long run if you find yourself frequently treating your car for scratches. 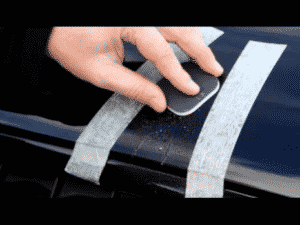 Remove Car Scratches with this step-by-step car scratch remover system. Fix car scratches using a system designed with professional formula and accessories permanently removes 80% of clear coat auto scratches. High quality professional reusable components, plenty of formula and VIP support takes all of the guess work out of how to remove car scratches. A investment you can count on, today, tomorrow or next year. The Ultimate Car Scratch Remover can remove scuffs fast, No Experience - No Problem, everything in one box no guess work involved. This system is superior to cheap throw away kits that supply paper towels for polishing, tiny strips of wet sand paper and tiny 25gram tubes of polish which can give hit or miss results. 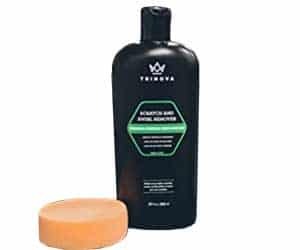 All cheap throwaway car scratch remover products require other items to do the job correctly, which can introduce mistakes if you have to improvise. Safe-T-Sand patented 3000 grit PROFESSIONAL reusable wet sanding sponge for "borderline" clear coat scratches. This PRO accessory delivers superior results with a perfectly burnished surface that quickly polishes to a mirror finish. Safe and superior results when compared to cheap throwaway kits that supply tiny strips of paper which typically cause more problems than they fix. Tiny strips of wet sand paper is defiantly NOT how a professional would use wet sand paper on a clear coat finish. Upgraded 120ml bottles plenty of formula to remove dozens and dozens of scratches. Unique professional formulas are exactly what you would find in a pro's tool box. The polish removes scuffs and scratches permanently and delivers a brilliant shine. It is not a cheap cover up polish product that is only a temporary filler. This offering from a Chicago based body shop has everything you need to get started removing scratches in one simple kit, but the true focus of this product is the treatment chemical. How does this lower price option stack up against industry heavies? As with any product, there are some good points and some flaws. Let’s talk about the positives first. The shining feature of this kit is the chemical. With 12 ounces to a container, there’s plenty to go around, and this stuff works. Although the manual states that, like other car scratch removers, the product generally only works on superficial scratches that can’t be felt with the tip of the fingernail, it actually worked on some deeper scratches during our tests. On top of that, the treatment is actually gentle enough to use on plastics and headlights, meaning you won’t have to waste time and money seeking out multiple products to give your whole car that showroom shine. The price of this product is great, too, especially considering the high quantity of the treatment chemical you get with each order. Last but not least, this car scratch remover provides a truly brilliant shine, and completely removes swirls as well as your standard scratches from keys and branches. However, the buffing pad that comes with this system doesn’t quite measure up. It’s not highly durable, and seems a little harsh for dealing with superficial scratches. Luckily, this is an easy problem to fix. If you have an orbital polisher, this system is even more effective. However, if you don’t have a tool or the extra cash to invest in one, a few sheets of sandpaper from your local hardware store will help this product bring your ride’s finish back to life. As luck would have it, this car scratch remover has a couple of other great features going for it as well. Foremost among those is its simplicity. 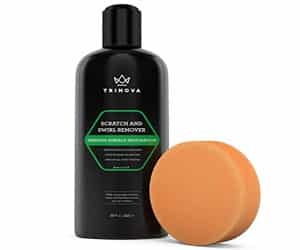 While some others among the best car scratch remover systems have created a complex process, TriNova’s approach is great because it’s simple. This makes it a great choice for anyone without much experience, as well as for those of you who don’t have a ton of extra time on your hands. While the buffing pad that comes with the chemical isn’t the best, it’s important to remember that the treatment is the star of the show, while the pad is more of a free bonus. With some sandpaper or a polisher, anyone can make this kit work for them. Because it’s simpler than a lot of other systems, I’d also recommend it to anyone who’s never polished their car before, as well as those of you who don’t have a lot of free time. When it comes to the best car scratch remover products, many of them are focused on one thing and one thing only: the top coat over the body paint. That clarity of vision has led to some serious innovation in scratch remover formulation and technique over the years, but it leaves out the details that some car owners crave. If you’re focused on detail work, such as removing interior scratches and scratches on headlamp covers, side mirror backing, and more, then this three piece kit might just be the best product for you. As a plastics polisher, this set uses gentler chemicals and a softer approach that won’t damage the non-metal parts of your car. It’s great as a supplement to other car scratch remover systems, or on its own. Having an eye for detail can make your whole ride look a lot better. In addition, polishing your headlight covers regularly can not only make your car look better, it can make it safer. As headlights take on scratches and grime from the road, they lose their effectiveness. Throwing some of this great plastic polish on can not only bring back their old shine, but make you a better driver. 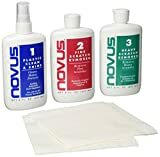 This set of three formulas (a cleaner, a shallow scratch remover, and a deep scratch remover) also functions as a scratch remover for CDs and DVDs. The best part, however, is its variety of applications for plexiglass windshields. Motorcycles and vehicles like the Polaris Slingshot, as well as golf carts, often have plexiglass windscreens that can easily become scuffed. Even many newer cars have plastic or plexiglass windshield trim. 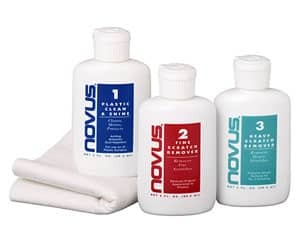 This car scratch remover from Novus can restore the original clarity and shine to all of these. The major downside to this product, of course, is that it’s not intended for use on the main body of the car. Keeping that in mind is important when deciding whether or not this is the product for you. This is a great product for anyone with seriously scratched or scuffed plastic or acrylic components. I’d highly recommend it to anyone who has important plastic components on the exterior of their car, or plexiglass windscreens like those used on motorcycles. 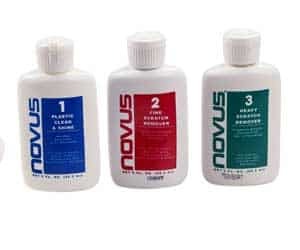 It’s also a great supplement for anyone who already has another of the best car scratch removers for their body paint, but wants a separate product designed specifically for detailed work on plastic and acrylic components. This is one of the most innovative products I’ve tested. Is it also one of the best auto body paint detailing systems around? Ultimately, you’ll have to decide. First, it’s important to understand what this product is. While it’s not exactly a car scratch remover, it serves some of the same functions, which is why it’s featured in this article. For some users, this system might be perfect for combining with a traditional scratch remover, while for others this formula will work perfectly on its own. 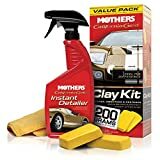 Mothers’ clay bar wash system is designed to take much more dirt, grime, and even corrosion out of your top coat than any other cleaner or wax. It’s also gentle enough to use on plastics, meaning that you can use this to give your whole car that showroom shine. 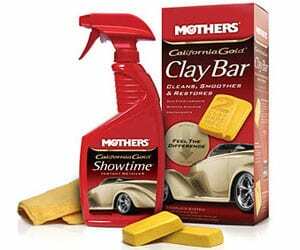 The system works by combining a gentle but tough cleaning formula with the included clay bars, which are the real star of the show. The kit also includes a microfiber cloth for cleaning up residue, but the clay bars do most of the cleaning. While there’s a wide variety of clay bar systems out there, this is one of the best that’s affordable for everyday users. It’s not dirt cheap, but it won’t break most budgets, and it works extremely well. This is a great product for those looking to clean up their ride’s top coat, as well as for any detail work you might need to do. That being said, it’s not designed to remove large scratches, but rather as a deep clean. It’s perfect for anyone struggling with corrosion or embedded dust and debris, and also works great as a pre-treatment before applying one of the best car scratch remover systems. If your only problem is scratches, though, this may not be the best choice for you. You can’t talk about scratches and detailing without bringing up industry giant 3M. How does their simple but powerful 39071 Scratch and Scuff Removal System stack up against the competition? At a bargain of a price, this system still offers a wide variety of features that will help you have an easier time removing scratches from your clean coat. First among these is its usability. While many other systems rely either on a more specialized orbital polisher or on old fashioned elbow grease, this system integrates with a household drill to give you the power of a specialized tool with none of the hassle. This kit also offers a unique three step process that helps get rid of scratches in various ways. While that makes it a tad more complicated than some of the simpler kits out there, it also means that it’s highly effective against different types of scratches. One of the small downsides to note when it comes to this product is that it only comes with a small amount of the two liquid formulas required to carry out the procedure. That being said, all of the accessories except for the sandpaper are reusable, and sandpaper and formula are available separately and at a fair price. The pricing of this product is also one of its prime features. At only a fraction of the cost of some other scratch removal products, it still performs at the top tier of car scratch removers, which might just make it the ideal choice for any driver on a budget. On top of that, the 3 step process and the chemical formula are gentle enough to use on non metal areas of your car, meaning this can also be used to polish door handles, trim, and other accents on your car. While it might be better to approach these more delicate materials with specialized products, it’s good to know that 3M can cover both these and the top coat more generally. Offered at an extraordinarily low price point without an impact to performance. This may be the perfect choice for the user on a budget. It’s also a potentially great option for anyone who doesn’t want to go to the trouble of removing scratches by hand, but also doesn’t want to purchase a specialized tool. All in all, it’s a highly effective little package with few flaws of note, and it offers top performance at a steal of a price. I would recommend it to just about anyone. Now that you’ve read about some of the best products on the market, let’s look at some of the factors that make for a great car scratch remover (and some of the things you should keep in mind while choosing which one to purchase). Just as sanding removes defects and splinters in wood by gradually, carefully wearing it down to create an even surface, car scratch removal saves your car’s top coat by eroding it. The thin top coat over your car’s paint is very gradually worn down by a combination of an abrasive chemical and the action of either your hand or tool, which creates friction. By evening the surface again, the appearance of scratches can be reduced or even totally removed. Many of the best car scratch remover systems also feature a filler wax that replaces the bits of top coat that are worn off. Even so, it’s even better to wax your car right after removing scratches, to restore your top coat so that it can protect your paint job and give your car that brand new shine. Some of the best car scratch remover kits feature a waxing step after the main abrasive portion of scratch removal is done. Car scratch remover can do a lot for the look of your car, but it’s important to measure expectations too. Even the best car scratch remover products only repair your top coat, which is the clear coating that goes over the colored paint on your vehicle. If the actual paint is scratched or chipped—in other words, if you can see the plain gunmetal gray of the car’s body—it’ll take more than a car scratch remover to do the trick. If you have the right equipment, you can touch up your paint job at home and use a car scratch remover to touch up the top coat. Most people will need to go to the body shop. For small but deep scratches, there is a middle way. Small containers of paint are available that, when combined with the best car scratch remover kits, can make your paint job look fresh again. However, if you have scratches that are both wide and deep from a collision or serious vandalism, the actual paint beneath the top coat needs to be repaired first. Here’s a good rule of thumb: if you can get the tip of your fingernail into the scratch, it’s likely too deep to repair with polish alone. Every car scratch remover is a bit different. Some are designed to be used by hand, while others will only work with an orbital polisher or similar tool. Still others are operable either way, and some work with a household drill. It’s important to keep in mind what tools you’ll need to use a given system before you buy. 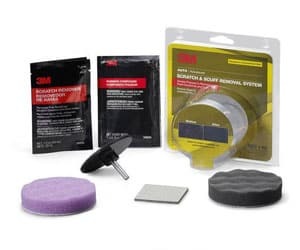 Many of the best car scratch remover kits come with everything you need right out of the box, but some of them are designed for slightly more specialized uses. That being said, there are a few general rules of thumb when using any car scratch remover. Keep these in mind, but also be sure to thoroughly read and consider the instructions for your chosen product. Different removers, different scratches, and different cars will all require different amounts of pressure and force to repair. Because it is possible to further damage your top coat with a tool meant to save it if you’re not careful, it’s best to start as gentle as possible and gradually increase speed and force as you need to. This is easy if you’re using a tool with specific speed settings like an orbital polisher or most drills. If you’re using your hands, simply start with slow motions and without applying a lot of pressure. Then increase your forcefulness if a lighter touch won’t get rid of the scratches. Following this tip will prevent you from applying more force than you need, which will save your top coat (and make everything easier on your arms!). Whenever you’re working with chemicals, it’s best to stay in a well ventilated area. Remove your top coat scratches outside rather than in the garage. You might also consider wearing a ventilator or face mask. Other key safety equipment, like goggles, are also advised for anyone in the area. I’ve said it before, but I’ll say it again: applying some wax after you finish removing scratches from your car’s top coat is almost as important as the scratch removal itself. That’s because car scratch removal actually wears down your top coat in order to make its surface even. While that’s the only way to remove scratches, it’s important to repair and protect your top coat after the job is done. Many of the best car scratch remover kits include wax, and offer waxing instructions in their step by step processes. On the other hand, some kits are more minimalist. Check the contents of your kit before you buy, and if it doesn’t come with wax, order your favorite brand or the one the scratch remover’s maker recommends. If you’ve never waxed your car before, don’t worry: it’s even easier than removing the scratches! Of course, it’s also important to clean your car’s top coat before using a scratch remover kit. Any dust or grime could get in the way, or even further damage the top coat when combined with the chemical and friction abrasion of the kit. While there are plenty of disposable kits of greatly varying degrees of quality out there, many of the best car scratch remover systems are intended to last a bit longer. Even with disposable kits, it’s possible you could end up with a not insignificant amount of leftover formula after your job is done. That means it’s important to learn how to store your car scratch remover products in a way that’s safe for your tools, you, and your family. Luckily, storing accessories you haven’t used is pretty easy. Use common sense, but beyond this there aren’t many special requirements for most kits. Any reusable accessories that have been used should be thoroughly washed before storage to prevent buildup or even damage. This is especially true of clay bar cleaning kits like the one offered by Mothers. Because the clay bar is essentially part of the cleaning formula, it can get pretty dirty, but it’s also an essential component. Storing the chemical products used to buff your top coat scratches is the more challenging part of proper storage. Store all your car scratch remover treatments in a cool, dry place. Remember to keep all your household chemicals away from children and pets. If your container sits for a while, be sure to check it for leaks or other signs of damage. Following these simple care and storage instructions, along with any more specific instructions included with your chosen car scratch remover, will help your products last longer and perform better. I hope this article has taught you a great deal about the best car scratch remover systems, from how they work to which one may be best for your needs. 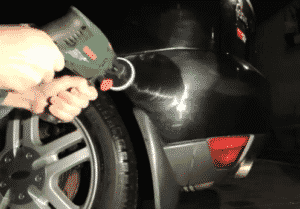 In any case, it’s time to name the best of the best car scratch remover kits. After extensive research and testing, my choice is The Ultimate Car Scratch Remover System. While I was a bit skeptical at first that any product could be as great as I had heard this one is, I was seriously impressed with everything from the quality of the components to the ingenuity of the design. Although this system is a bit more complex and expensive than some other options on the market, it offers some serious advantages over simpler systems, and still packs an incredible value. If The Ultimate Car Scratch Remover System is completely out of your budget, I’ve got a section on the best budget alternative below. The quality and reusability of the accessories increases the kit’s value a great deal despite its slightly higher price point. Between the clarity of the instructions and the brilliant conception of a complete, but also completely doable step by step car scratch removal process, anyone can remove scratches from their top coats and restore their rides’ former glory. The liquid formula included with this kit is more powerful than that with most of the cheaper kits, but at the same time isn’t so harsh as to damage the top coat unnecessarily. I also admire the kit’s expandability, and the fact that the same company creates custom paint and primer touch up kits for users with extreme scratches. In addition to the obvious convenience factor there, it shows that the company truly stands behind their products. All in all, I would recommend this step by step system to anyone with car scratches, especially if you’ve tried other products and failed (while keeping in mind that anything going below the clear top coat will require paint touch up). Of course, not everyone has the cash to get The Ultimate Car Scratch Remover system. After all, you’re removing the scratches yourself to save money! 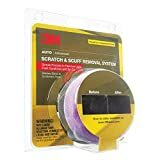 If you’re on a tighter budget, there’s no product I could recommend more highly than 3M’s 39071 car scratch remover kit. Without any specialized tools, and with simple, clear instructions, this kit allows you to give your ride’s top coat a professional polish with only a standard household drill and a little effort. In addition to its relative simplicity, I really like this kit for its low price and its amazing results. I also appreciate that the kit truly does come with everything you need (except the drill, of course) to start removing scratches right away. Many of the other kits at this price point don’t include high quality sandpaper or other necessary accessories. On top of that, 3M’s chemical formula is truly impressive, with just the right combination of abrasiveness and gentleness to get rid of pesky scratches while not damaging the top coat. It’s even gentle enough to use on trim and other non metal components! Between the versatility and quality of this product, I’d recommend it to anyone on a tight budget. It’s also great for anyone who wants a slightly simpler 3 step system, though it is worth mentioning that this is still a bit more complicated than the single step kits out there. I hope this article has helped you find the perfect car scratch remover kit to meet your needs. Whether you have a few scratches on your trim, a single key mark, or anything else, one of the products discussed here should meet your needs. If you’ve tried any of the best car scratch removers I talked about today (or if I left out your favorite), let me know in the comments! I’ve had a lot of trouble with scratches on my cars over the years, and wouldn’t wish it upon anyone else.